When we coined the phrase, "The Industrial Evolution." 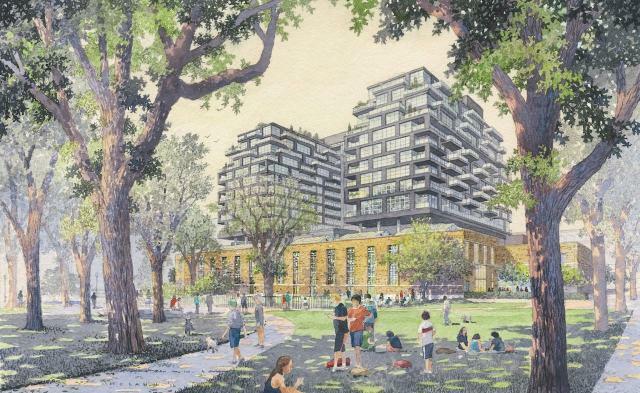 it was less an advertising slogan than a descriptive for our transformation of the 1930's era public utilities building into stylish city condos, a beautiful, bountiful and voluminous Food Hall and Toronto's newest fully-outfitted YMCA, all connected to the city's St. Andrews Playground. Waterworks artfully blends heritage industrial architecture with cool, head-on modernism to create a building that will redefine the genre. The condo suites at Waterworks are conspicuously awesome, ideal life spaces for urban adventurers and downtown devotees alike. We define the features and finishes found in each suite as contemporary cosmopolitan and the myriad of amenities as definitively deluxe. Throughout the building are echoes of the past, craftsmanship remembered and duplicated for today's lifestyle expectations. A home, a Food Hall, a park, with all of downtown at your doorstep. Marketing and press: Faulhaber Communications, L.A. Inc.